If you are looking for recycled, reconstructed and custom clothing and accessories then you need to see FrankenClothes Designs. Maggie, the owner of FrankenClothes Designs, likes to recycle so she reuses items in a very unique way for her creations. Bonus for Joy De Vivre winners-mention this blog and Maggie will give you 20% off of your FrankenClothes Designs purchase! 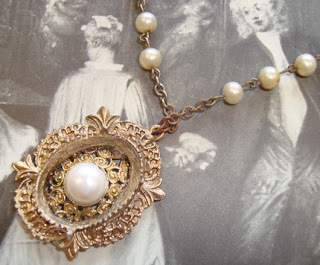 The Vintage Reconstructed Necklace is made form a vintage rosary. 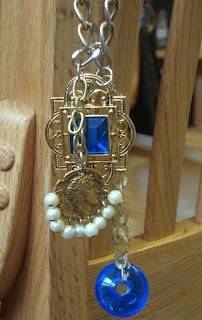 Vintage Blue Bohemian Necklace is made from gold chain and vintage pendants. 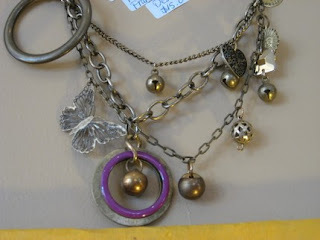 Random Necklace is a mixture of bells, charms and coins. Custom items are available upon request. And what you may ask do we have for you all this week? Boy am I spoiling you or what! 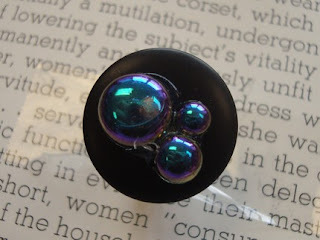 ;) This week Maggie has given the Bubbles Ring for our giveaway! To enter leave a comment for FrankenClothes Design and tell Maggie what your favorite item from her shop is. You will receive an extra entry by becoming a follower of this blog. Entries will be accepted from now until Friday at noon. Come back after that time to see if you are the lucky winner! Nice shop, like that bubble ring, very unique. Nice items in the shop. Thanks for showing it to us. Awesome creations! I love the way she has transformed the use of all the buttons we have laying around wasting space! And thank you guys for commenting! Please Say It Isn't So!